JOIN US AS WE STAND TOGETHER TO FIGHT BULLYING! 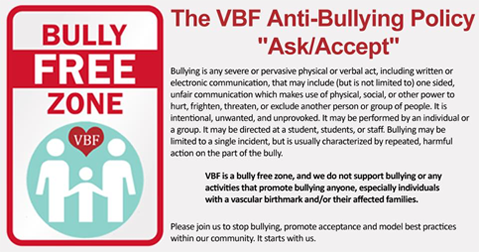 Sign the Anti-Bullying Pledge today and YOU can help us reach our goal of gaining 2,500 signatures this year. Share the pledge with your loved ones to sign in honor of you or someone you love who is living with a vascular birthmark. By standing together against bullying, we can make a difference. 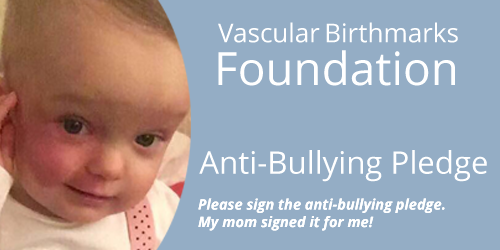 But especially for those individuals and families who are affected by a vascular birthmark, anomaly, or syndrome. Join the pledge by adding your name!